Does a diode block current but not voltage? Does it mean a diode blocks current but not voltage ? Figure 3 from the 1N4148 datasheet. Diodes have very small leakage current. At 3 V this will be between 3.5 and 10 nA. The 2N7000 has a gate−body leakage current, Forward of -10 nA max. The diode also has about 4 pF capacitance. When the supply voltage jumps from zero to +3 V on power-up the diode capacitance will cause the gate of M4 to jump up too. 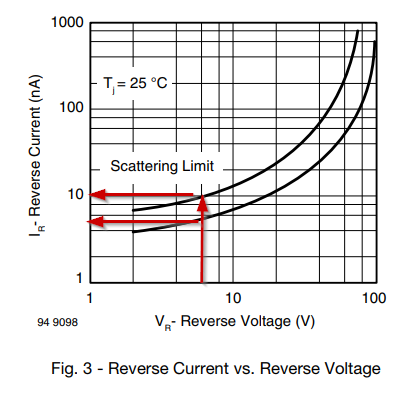 The effect of voltage that you care about in most electronics is current. When a device blocks current, it makes voltage inconsequential, save electrostatic effects. The problem in the circuit shown is that it essentially leaves an unshielded MOSFET gate floating (no current path to or from it). A floating MOSFET gate is almost always a design error, leading to undefined behaviour. The idea of blocking voltage is a nonsense. You need to think the problem in terms of "resistance" and voltage divider (I'm putting quotes around «resistance», because it's not reactive but it's heavily non linear). Since the transistor is a MOSFET, it's gate has a much higher resistance than the resistance offered by the reversed diode (because of the leaking current) and the divider made from the diode D3 and the M4's gate transmit nearly all the voltage to the gate. So the solution is simple : Just put a high value resistor between M4's gate and the chassis ground. The presence of a voltage between two points of a circuit means we measure a difference in electric potential with the value \$U\$. So, if there was a conducting path between these points with \$R<\infty\$ there would flow a current \$U=RI\$. The presence of a potential difference (\$U\$) doesn't mean any electrons could get from A to B, but that one spot would accept the "surplus" from the other. A diode is, in theory, \$R=\infty\$ in one way and \$R=0\$ in the other. However, those approximation isn't true in reality. This can lead to a small current flowing "backwards" through a diode. Not the answer you're looking for? Browse other questions tagged circuit-analysis or ask your own question. 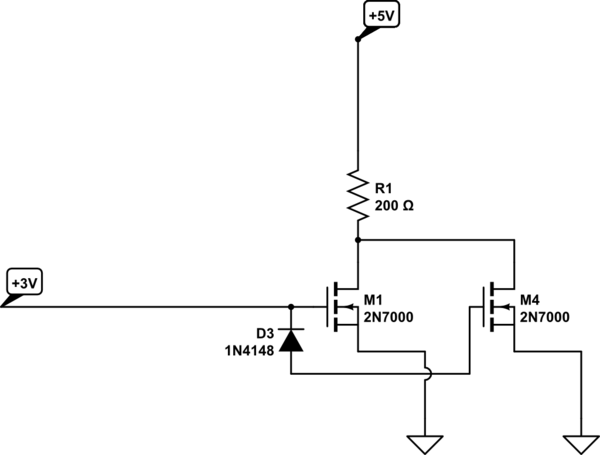 What sets the source voltage in this simple CMOS circuit if the current source is 0A? Should I use superposition if there is a sine wave current source and a DC voltage source in a circuit? Why does not current flow in open circuit wire connected to a closed circuit? How do I solve the current of this circuit with a diode?